Is China able to surpass the U.S space program? America’s Gold Crisis: Why are countries increasingly withdrawing their U.S-held reserves? Swedish authorities have refused to offer their halls for the screening of Kosovo: A Moment In Civilization, a Serbian documentary movie directed by Boris Malagurski which exposes the atrocities committed by Albanian terrorist groups against Serbian civilians in Kosovo. The movie was originally scheduled to be premiered on November 26th in the Swedish capital city of Sweden. However, the organizers were later forced to relocate the screening to one of the halls of the Syrian Orthodox Church in the city of Södertälje after ABF (Sweden’s largest adult liberal education association) refused to offer its own facilities for the screening of the movie. The Albanian internet portals have shedded some light on the subject, namely by copying Facebook status of Salih Shala, the leading Albanian lobbyist in Sweden. In his statement, Shala said he contacted ABF and demanded the screening of the movie to be banned. He then received a positive response from the association, saying that screening of the movie is banned due to its content violating the Swedish laws and the right of equality of all people in Sweden. How can such movie be considered racist, while Ramush Haradinaj’s war crimes artistic freedom, is not exactly known. In an email to the organizers of the movie premiere, namely the Serbian Association in Sweden and the Brotherhood of St. Jovan, ABF confirmed that screening of the movie is banned, noting that the association has become aware that the brief review of the movie which was submitted earlier did not conform to the movie title and its content. “ABF is not a broadcasting/screening authority”, said Malagurski in an interview with Sputnik. “As such, I do not know how could they come up with a conclusion that the movie is not suitable for screening, given that they obviously haven’t even looked through the content”, he added. Malagurski pointed out that he personally contacted ABF to find out what exactly was “wrong” with the movie, but failed to receive a response. “This is an obvious example of censorship and violation of freedom of speech, triggered by a single ethnic lobbyist who is trying to use the Swedish equality and human rights to his own advantage, to a degree that he is violating them completely”, Malagurski said, adding that he was glad that the organizers were able to find a solution in such a short period of time, namely by screening the movie in the hall of the St. Jacob of Nsibin Syrian Orthodox Cathedral in the city of Södertälje. “The Syrian nation knows what it means to destroy one nation’s culture and historical heritage. The ABF should have recognized the obvious fact that since 1999 more than 150 churches and monasteries literally in the heart of Europe were destroyed. I wonder if ABF will also ban the screening of destruction of Palmyra due to the content being offensive to the ISIS supporters in Sweden? ”, Malagurski asked. 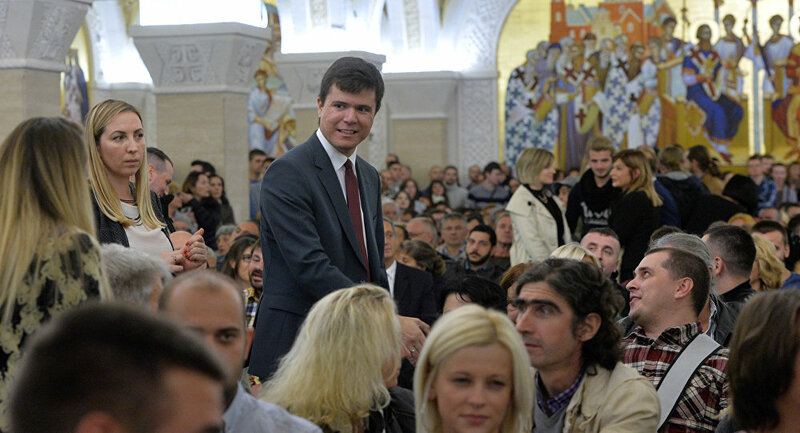 Goran Popov, one of the organizers of the event from the Brotherhood of St. Jovan said that in such a liberal country like Sweden where theoretically all of the voices are allowed to be heard, one would hardly expect such occurrences, noting that the whole ABF charade is incompatible with the liberal values otherwise so typical for Sweden. © Center for Syncretic Studies 2014 - 2019 - Fort Russ. All Rights Reserved.